mg = milligram, µg = microgram, IU = International Units. Vitamins: L-Ascorbic acid - 13,636 mg/Kg, Niacin - 2,273 mg/Kg, Thiamine Mononitrate -1,851 mg/Kg, Pyridoxine hydrochloride - 1,159 mg/Kg, Vitamin E - 909mg/Kg, Riboflavin - 455mg/Kg, Folic Acid - 36 mg/Kg, D-Biotin- 50 mg/Kg, Vitamin D3 - 2mg/Kg, Cyanocobalamin- 1.4mg/Kg. Small dogs: 1 tablet per day. Medium dogs: 1-2 tablets per day. Large dogs: 2-3 tablets per day. If required, break tablets up and mix with food. Do not give more than the recommended intake. The benefits of the ingredients in SuperDog are thought to build over time. A regular intake is therefore recommended. SuperDog is a complementary pet food for dogs. This is not a treatment or medication. If your dog has symptoms or is unwell seek veterinary advice immediately. Fresh drinking water should always be provided. Not suitable for puppies under the age of 12 months. Store below 25°C in a dry place, out of sight and reach of children. 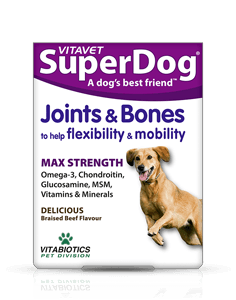 Why has SuperDog Joints & Bones been developed? Why is it that dogs may benefit from nutritional supplements? Can SuperDog Joints & Bones be used simultaneously with medicines? How many tablets does one pack of SuperDog Joints & Bones contain? How and when should SuperDog Joints & Bones be used and what are the precautions? For how long should SuperDog Joints & Bones be used? - Linseed- as a source of Omega-3 fatty acids to help maintain healthy joints and bones. - High strength Glucosamine Sulphate for its role in maintaining healthy joints by supporting the body's ability to generate and regenerate cartilage. - Chrondroitin Sulphate - produced naturally in the body, it is a major component of cartilage, to help to keep cartilage resilient by absorbing fluid into the connective tissue. - Vitamin C - also a cofactor in the production of collagen, one of the main constituents of joints cartilage and bones. - Ginger - often used in joint health and to help support a good circulation. - Green lipped mussel - renowned for helping to maintain joint mobility and synovial fluid. - Methyl Sulphonyl Methane (MSM) - a well-known antioxidant for helping to maintain supple and flexible joints. - Calcium for helping to maintain bone strength and optimal bone mineralisation, as well as healthy teeth. - Magnesium, copper and vitamin D3- essential for healthy growth and development of bones (and teeth). It is difficult to sometimes know the exact micronutrient content of what our dogs are eating. Pets eat highly processed food where the ingredients may be of questionable origin or are loaded with artificial colours that make the food look more nutritious than it really is. Some foods may have a lower than expected nutritional content. Your average tinned dog food may not necessarily provide dogs with all they need to help support strong bones and joints and rarely include special nutrients such as Green lipped mussel , Methyl Sulphonyl Methane (MSM), Ginger Glucosamine, Chondroitin and Omega-3 at optimum levels especially for joint and bone health. Therefore, pet owners need to make sure their dogs are receiving all the nutrients they need and so may wish to consider including specialist dog supplements into their pet's diet as a nutritional safeguard. Food supplements are of course not a substitute for a healthy balanced pet feed/diet. Generally, SuperDog Joints & Bones may be used alongside medications including anti-inflammatory drugs or NSAIDS that may be prescribed for your dog by your vet. SuperDog Joints & Bones contains only moderate levels of vitamins and minerals, and is free from any drugs or hormones. For specific advice on giving your dog SuperDog Joints & Bones tablets with medicines, we recommend that you contact your vet first. Owners of Diabetic dogs should consult their vet before using this product. SuperDog Joints & Bones contains 30 delicious braised beef flavour chewable tablets. Small dogs: chew 1 tablet per day, Medium dogs: chew 1- 2 tablets per day, large dogs: chew 2-3 tablets per day. If required, break tablet(s) up and mix with food. Not suitable for puppies under the age of 12 months. SuperDog Joints & Bones have no known side-effects when taken as directed. Do not let your dog exceed the recommended intake. In case of overdose, seek veterinary advice immediately. This product may not be suitable for use by those dogs that are allergic to shellfish. Owners of dogs with diabetes should consult their vet before using this product. SuperDog is a complimentary pet food for dogs. This is not a treatment or medication. If your dog has symptoms or is unwell, seek veterinary advice immediately. As with other food supplements seek professional advice before use if your dog is under veterinary supervision or has any underlying medical condition or is on medication. Results may vary amongst dogs as they do with humans, but in most cases, we would expect the beneficial effects of the nutrients in SuperDog Joints & Bones to build over one to three months. There is no maximum length of time over which SuperDog Joints & Bones may be used. A regular intake is recommended. "After taking SuperDog Health & Vitality for just a month Sweep’s coat is lovely and shiny. Sweep loves taking his vitamins it is something I defiantly will continue with him! " "I started my elderly dog Buzz on Vitabiotics for dogs and it has had a most remarkable effect. He is lively and full of energy, and is certainly running around with far greater ease and renewed vigour. "